Renthal’s Twinring Rear Sprocket puts new innovation and engineering into your drivetrain for outstanding durability. What sets Renthal’s Twinring sprocket apart is its unique construction combining a 7075 T651 aluminum inner ring, with an electroless nickel coated steel outer sprocket using a wave-patterned interference fit. This design combines the high wear-resistance of steel and the light weight of aluminum to create a sprocket that handles huge amounts of power while weighing half of conventional, all-steel sprockets. The flat-faced design also helps keep weight down while working with the self-cleaning chain grooves to keep the chain free of any abrasive buildup. 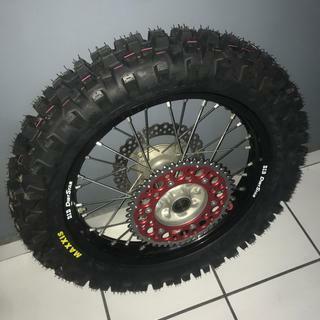 With 5 years of development and testing by Team Honda Off-road, Renthal’s Twinring gives you extreme durability and feather-light weight. You get the best of both worlds in one sprocket. Went on easy enough. Lighter than factory and still has steel teeth. Reasonable price. It presents signs of wear over the 3000 miles of use on Baja desert sand. Great product , it is what the pros use , they should know , they depend on great parts to build a race machine to earn a living with . Excellent life with a light weight core. Very durable. Just like the bullet points in the description-a bit lighter than a steel version but much more durable than aluminum. Mine is holding up well. Doesn’t quite look as good as an all aluminum anodized sprocket but I can forgo that for a few more rides before replacing. Would purchase again. This is the longest lasting sprocket I have ever used. It is well worth the money I would recommend it. 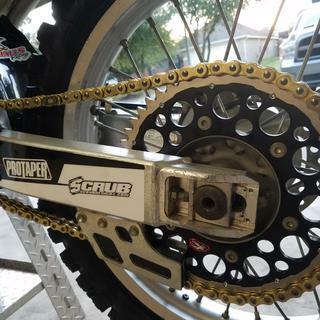 This sprocket really holds up well I run them on all my bikes and they last forever and look really good to! Has the factory race bike look! Great sprocket! You get the durability of a steel sprocket with some lighter feel of an aluminum sprocket. This is a awsome sprocket race three races in muddy conditions on a 450 and shows no signs of wear I love the twin rings. I bought this set-up for durability but was disappointed that the outer steel ring wore out faster than I expected. I switched back to a Dirt Tricks steel sprocket and haven't looked back. The Dirt Tricks offering is a better value if you're looking for durability. If you don't care about durability, I would just go with the full aluminum Renthal. Lasts far longer than the aluminum sprocket yet still feels as though it weighs the same. Great looking and reliable product. Sorry for the poor lighting. Complimented with a gold on gold D.I.D. chain. Best sprocket I’ve ever used. Lasts twice as long as super sprox, costs less and still going. Excellent quality sprocket. Fitment is perfect - went on without any issues. The idea of a lighter sprocket, with the durability of steel teeth is what sold me on the product. On first impression I like it, will provide additional feed back after a couple rides. These things last at least twice as long as completely aluminum sprockets. Keep your chain cleaned an oiled and no problems. 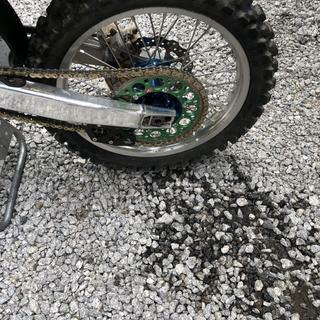 I bought all new renthal sprockets and chain for my kx450f and it's so quiet and smooth now. Plus, this sprocket looks amazing on my bike. Very pleased with the TwinRing Rear Sprocket. They are pricey but seem to last longer than other options. I may stick with a silver colored center piece next time though as when my chain block gets loaded up with mud when riding it strips the color off of the carrier. These are one of the best sprockets I've used. Hardly any wear after many hours on it. one of the best money can buy. when you have a rider wringin these 450s out for all their worth, you sure as heck better have a high quality sprocket and chain combo. you cannot just put anything on todays FI 450s. they require absolute solid strength and durability. the twinring gives best of both worlds also, the lighter inner and the steel teeth. just cant get any better than that. I wanted an orange Renthal rear sprocket for my new KTM so I ordered one of these. Yeah it's a tad heavier than a regular aluminum sprocket, but Unless you're racing pro class it's not gonna matter. It's super durable, lasts twice as long as a regular aluminum sprocket, and increases the life of the chain. Can't beat it. I've ran this sprocket for a few months now and really like it. it looks great and seems to not show any wear. Strong sprocket that lasts a long time when matched up with their chain. Great product. I haven't seen any wear in well over a couple thousand off road miles. These things is a beast. Very sturdy, takes a beating and still straight. 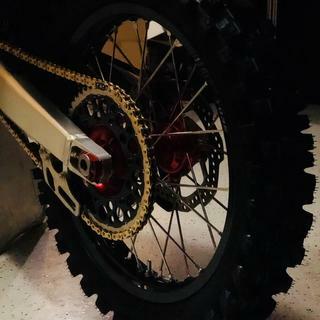 Awesome sprocket. Aluminium inner for reduced weight and steel out for longer lasting. 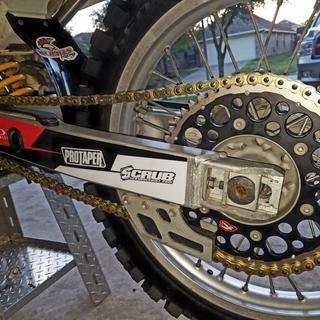 Great sprocket and quick install. Very good product and well worth the money. These sprockets are the way to go on any big bore four strike that eats through aluminum chains! You can't do much better than this sprocket from a looks, performance, and durability stand point. I put this on my KTM 300 and have logged about 800 miles so far, and it still looks new. 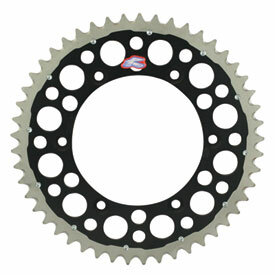 Im not worried about weight, this sprocket looks good along with a steel outer ring, wear rating is great. will buy again. I've had the Renthal on my 500XCW for a little over 25 hours and its showing significant wear. By comparison, I had a SuperSprox on my last two bikes (yes, I used it on both) and it never showed much if any wear. The Renthal isn't terrible but its no Supersprox which by the way is less money; Its a no brainer. ran this sprocket for nearly 25 hrs with absolutely no signs of wear up until I traded in the bike. Will be purchasing again for new bike. Good sprocket. Not sure I'd buy again tho. Great sprocket but fell recently and the sprocket hit a rock and the outer ring of the sprocket got knocked off the main portion of the sprocket. Had to remove the wheel and knock it back into place just so I could get home. Scrapped it after that. Previously used this sprocket on 3 different wheels. The sprocket is holding up well, and seems more durable than the full aluminum sprockets. I am a little concerned about the screws that secure the steel ring to the sprocket, a couple have come loose. I re-tightened them with permanent loctite, but I think Renthal should find a more permanent way to assemble these sprockets. I finally stepped up and spent the extra money on the TwinRing. It's so worth the extra money. I won't ever use anything else. Excellent product! Looks great and has virtually no wear after a summer of riding. I'll definitely buy another, if it ever wears out. Got a good year out of it, and it still looks great. probably have about 3 or 4 thousand miles on it. Highly recommend. 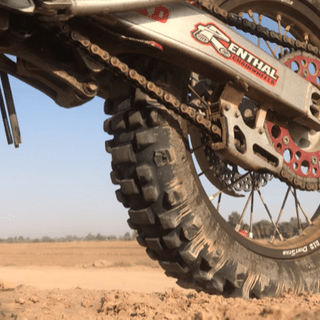 What size sprocket do you need for super cross and then out doors? BEST ANSWER: There is no "right" answer to this question as it is a personal/bike preferance. Typically for supercross you would use a larger rear sprocket like a 50-52 tooth and for more "open" tracks like outdoor you might use a 48 tooth. Talk to your local dealer/other riders or read some online forums and make an educated decision based on that. I would choose a sprocket of one to two teeth larger if you needed quick acceleration and a tooth or two smaller for more top speed but it also depends on your riding style. 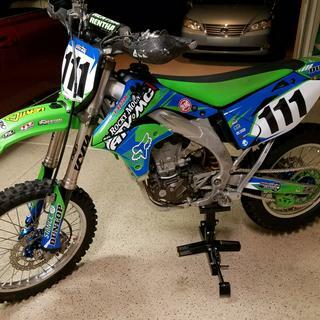 I have a 2013 Honda CRF450R and I run a larger (2 tooth) larger on the rear for all riding. It helped lower my ratio and helped flame out and I like the lower ratio. Does this sprocket come with bolts? BEST ANSWER: Yea it does. I have a 2018 KTM 500 EXC with stock gearing 14 / 45. 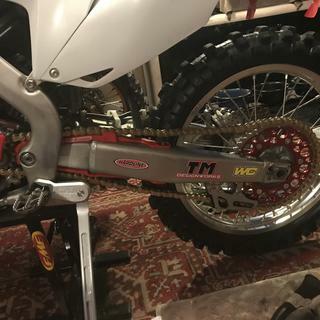 If I went up to 50 tooth in rear can I use the stock chain or would I have to go 48 tooth ? I am really interested in those rear silent sprockets like on the Honda 450l. Do you carry those? BEST ANSWER: I would assume you would need a new chain for a 50 or a 48 tooth rear sprocket. It depends on if your existing chain has enough space and will not bottom out on the chain adjuster blocks toward the front of the swingarm. I would be happy to look into this further for you, if you can send me a picture of your machines swing arm. Our email is tech@rockymountainatv.com. 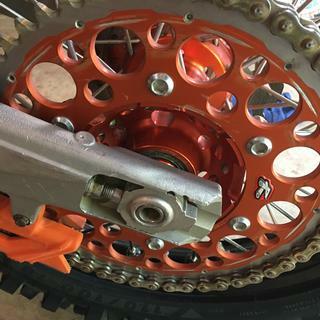 Your machine 2018 KTM 500EXC should have come with a rubber dampened front sprocket. We do not have a rear silent sprocket for that machine. The sprocket you are talking about on the Honda came from the factory with the machine. It says available in 51 but I've never seen one here in your choices. Have a 52 on right now and have zero top end left, wanting to go back down one tooth. Can Rocky Mountain get em or nah? BEST ANSWER: Sizing will vary by machine. What is the make, model, and year of your machine? Once I have this information I will be able to check into this for you. Thank you. We do not have this specific sprocket in a 51 tooth for your machine. However, below is a link to the 51 teeth sprockets we carry for your machine.